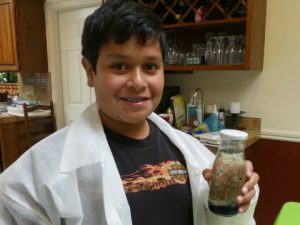 Learn how to do a bottle bubbler science experiment at your children’s science birthday party, for a rainy day boredom stopper or a homeschool project. Children can be very easily, and cheaply, entertained with just a few everyday items you may have around the house…and to big effect. Do you want a fun way for children to get excited about science and help their minds to think creatively? Once you have introduced them to the simple scientific analysis they will be begging you to find other experiments for them to do! 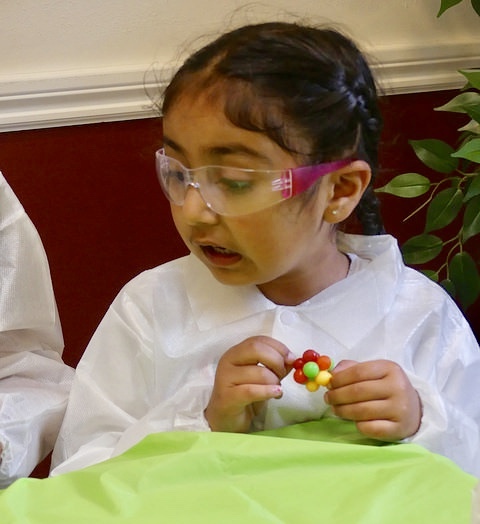 Give them child size lab coats to wear and they will really feel like scientists. It is the perfect way to introduce the ‘scientific method’ to them. The blog Layers of Learning has a fun ‘experiment write up sheet’ that help the children to get comfortable with the vocabulary and stages of the scientific method. The Khan Academy has a fun toaster analogy to explain it in simple terms too. The scientific method is an iterative process. In other words, it’s a cycle rather than a straight line. The result of one go-round becomes feedback that improves the next round of question asking. For more information about Scientific Method, see at the bottom of this post. We had so much fun creating these bottle bubblers. The children were enthralled, and actually weirdly quiet they were concentrating so much. Until the bottle bubbler came to life. Then they did!! They really grasped the vocabulary and concept of the scientific method, too. I was so proud of our budding scientists! Remember to encourage the children to hypothesize what may happen before they start. Alka-seltzer. Cooking oil. Water. Food Coloring. An Empty water bottle (or glass jar with lid). Optional – provide disposable lab coats to set the scene and keep them clean. Fill the bottle with oil. Two-thirds of the way. Top up the rest of the bottle with water. Leave a couple of inches free at the top. Add a few drops of food coloring. Use one or more colors. Let them be creative. Be patient as the colors integrate. Break an Alka-Seltzer tablet into three (roughly). Drop one of the pieces into the bottle. This is when the magic happens! The reaction lasts for as long as the tablet takes to dissolve. To wake it up again just add another piece of tablet. Keeping it fun have a casual dialogue as they go through the steps. You could ask the kids to guess what will happen when they add the oil to water? Perhaps add the water and then talk about how it was or wasn’t like what they expected. What do you think will happen when you add the Alka Selzer? Why does it bubble? They begin to really enjoy being asked their ideas and opinions. You can ask them what other thoughts and questions spring to their minds about the experiment. 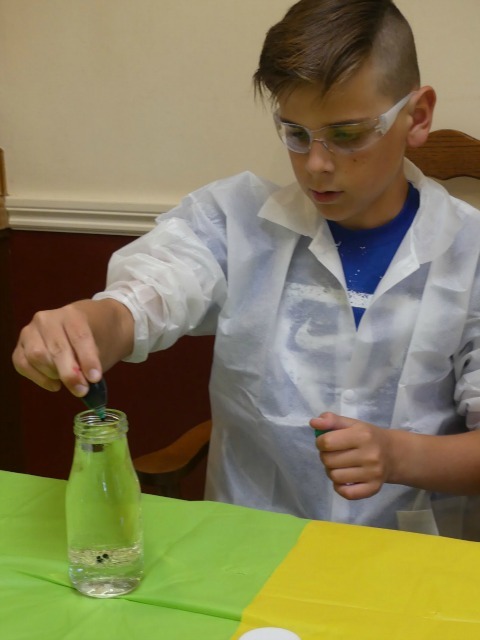 Here are some images of our young scientists in the ‘lab’. 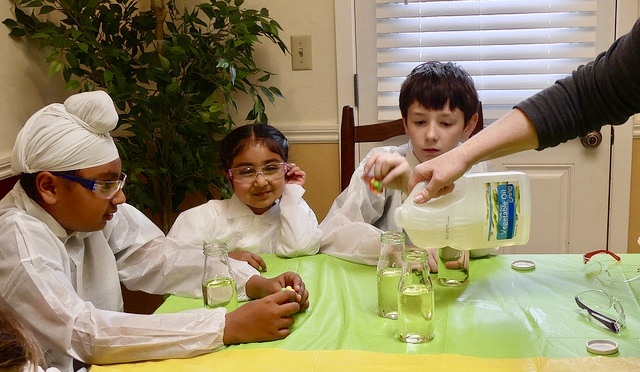 If you are looking for unique party ideas for your child’s science birthday party, this is such a fun idea. We will be posting more for you soon. Including a really colorful and fun science birthday party cake. The scientific method is part of the Common Core State Standards which was founded to assist students throughout their education to prepare for success in college, their careers, and life. By them reading the informational text give for the experiment parents can help their children develop skills for identifying and capturing the details of a text. The formula is basically to; Observe, Question, Draw up a hypothesis (a supposition or proposed explanation made on the basis of limited evidence as a starting point for further investigation); Test. Then to either change, expand, refine and perhaps reject their hypothesis.